In this blog, we will go through this new growth framework or growth model. Others might prefer to call it a model for customer growth, user growth or lean marketing funnel. You could also see it as a blueprint for a growth engine or growth machine. Because the intent is to keep it up to date, any feedback or ideas are of course most welcome. The reason why “digital” is included in the headline is that the tactics are mostly one you can use digitally to enable more growth. Many of the ideas come from optimizing growth for SaaS companies, and much inspiration comes from the startup world. Many are applicable to other businesses and business models, but there will probably be a few companies for which this growth model is not a perfect match—for example, product companies that sell through retailers and let the retailers do the marketing and sales. Another example is companies that sell large complex deals where the key account managers take a bigger part of what, in many other companies, can be automated or use digital marketing tactics. To work efficiently with growth, you need to understand your most important customer segments by creating marketing personas and customer journey maps. Other work in this step is keyword research and competition analysis to find the most beneficial content to create and the right features to build. In addition to the initial work with personas, customer journey maps, keyword research, and so on, you will also need to measure, analyze, and act on it continually. Analysis of every activity and the effects will also be needed in every step of this growth model. Use a process for rapid experimentation. Following up on your growth economics becomes increasingly important when you want to scale your growth. Then you’ll know in which area you need more growth experiments in. To grow, you need to reach new potential customers, get their attention, and get them to visit your site or anywhere else you have the possibility of nurturing them to move them closer to becoming customers. This step is about creating content that captures attention immediately. It is also about finding ways to reach your target groups outside your website with the created content and getting them to want to know more. The start of this phase is to get enough information on the visitor so that you can continue nurturing the relationship. Adjust the content of the landing page so that first-time visitors are driven towards continuing to read or leaving their information so that it is possible to nurture them even after they have left your page. The goal of this phase is to move a visitor toward becoming a prospect. This goal is mainly achieved through adjusted content delivered at the right time in the right place. Conversions can happen at any stage of a customer journey (micro conversions), but here it is meant as the conversion of a potential customer to a paying customer or a user of a free service. In the digital growth model, this step is possible to automate by, for example, triggered email sequences, “tripwires,” limited offers, showing benefits, offering several payment options, and so on. For some products and services, it is necessary to use an actual sales person to convince the prospect to make that final decision. When the customer has bought the product or service, the focus will shift to making the customer happy with his or her decision. Here we include onboarding to ensure that the customer actually starts to use the product or service and get to their Aha moment as quickly as possible. Ensure that the customer experience is so good that the customer wants to be a returning customer and, in the end, is so pleased that he or she is willing to share a recommendation with his or her network and friends. You can do a ton of marketing and conversion optimization, but if you do not have a product or service that resonates with your target audience, then you will never grow at the rate you want. This step is about developing your product or service in an agile way based on the lessons learned throughout the whole customer journey. This information could even lead to creating new products and services. In many cases, it is possible to adjust a product or service to support growth tactics. In some cases, it could even be the business model that needs to be changed to optimize for growth. It all started with my wish to create an overview of how all terminology and tactics fit together within digital marketing and growth hacking. The purpose was to use it as a way to store all the resources and ideas I have come across. However, it quickly became clear that I need a basic model to tie everything together. My first thought was to use the classic AIDA funnel, but with a modern modification (AIDCAS). Unfortunately, I felt that it became very uneven in the distribution of what can be done in each step. I especially felt that “Interest,” “Desire,” and “Confidence” could be summarized in one single phase to make the prospect ready for the buying step. Another idea that I tried was to use the most common model for growth hacking and startups: “Product Marketing for Pirates: AARRR” (Acquisition, Activation, Retention, Referral, and Revenue). Product Marketing for Pirates: AARRR! Even if the original was not drawn as a funnel, there are now plenty of variations of it where the different sections are placed in a funnel. It felt good in the beginning because each step was clearly separated, and it was fairly evenly distributed. I noticed, however, that it did not always work very well in its defined order when it came to companies other than classic startups with a SaaS (Software as a Service) model. 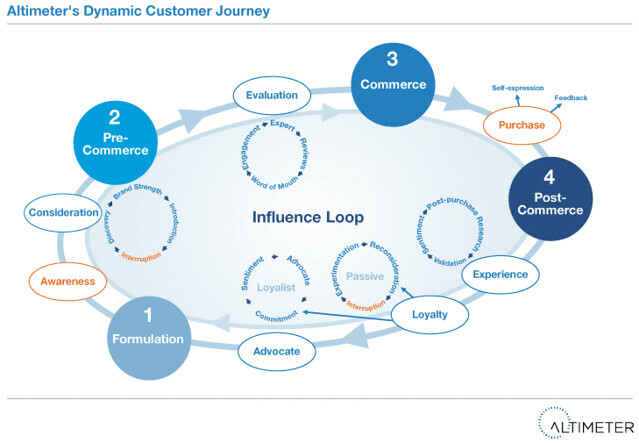 Many like to depict the customer buying journey as a circular process—for example, the McKinsey Consumer Decision Journey or Altimeter’s Dynamic Customer Journey. However, what I think everyone is missing are the preparations that need to be made by the company to understand future customers. Here we are talking about creating personas and then doing customer journey maps. Keyword research and competition analysis are other things that need to be done to some extent before starting to optimize the customer journey. The model I liked the best is the inbound methodology that HubSpot uses. It can also be illustrated as a sales funnel. In this new growth model, I have basically taken part of the HubSpot model but adjusted what belongs in its “Convert” step to include more than just capturing emails. Instead, I moved up the lead nurturing part from its “Close” step and placed it in “Nurture.” In the step I call “Convert,” I have instead chosen to focus on what needs to be done to take a qualified lead and turn it into a paying customer (or registering for a free service or app). The ultimate goal of your campaign. A conversion is whatever you decide it is – submitting a form, downloading a piece of content, signing up for a free trial, making a purchase. Every aspect of your marketing campaign should be nudging people toward conversion. Do you have a better word that describes the step you take to get the person to become a paying customer? Please let me know! Even if I include the whole funnel described by HubSpot and add the step to prepare (personas, customer journey mapping, keyword research, and competition analysis), then there is still something vital missing to make a complete model. It does not really matter how well you prepare or how well you optimize all the steps in the funnel if the product or service does not resonate well with the target group. Sure, you can achieve good results with great marketing, sales, and customer support even though the product or service is not that great, but to really juice up the growth, you have to enhance your product or service to enable better optimization in each step of the funnel. In some cases, doing so can even require a change of business model to achieve the wanted level of growth or the building of a completely new product or service with greater potential for growth. It is meant to be used as you would use a scrum board or a Business Model Canvas: up on the wall where everyone in the team can see it and with post-it notes or whiteboard pens for making quick edits and changes. However, the model I wanted needed to be on a higher level to start with and then be able to drill down into details on how to optimize each step with a bunch of best practices. It should be mentioned that even though this model is using a funnel and it seems like a person is just moving straight down, it is not meant like that. A person can move in, out, and back again in several of the steps. A person could even move through it in several different channels. You could also go through a mini version of the funnel. For example, the customer journey to download a lead magnet could also be viewed as nurturing a person to convert him to giving away his email address as the price for getting access to the lead magnet. After that, you want the person to use the lead magnet and be so delighted with it that he wants to share the link to many more. An even clearer example is when a company has a trial version because then the whole funnel can be used for the trial version even though the customer has not bought anything yet. Even though the steps “Analyze” and “Enhance” are visually placed outside of the funnel, they should be thought of as something that is both done before the funnel and simultaneously with all steps of the funnel. The continuous work should be an agile approach where you measure, analyze, brainstorm, prioritize, test, implement, and start over again. This model brings up most factors to increase the growth of customers for existing products or services. The model can also be used to evaluate and test if new products or services have growth potential. There are a few more strategies a company can use to improve growth that are not included in this model, such as the acquisition of other companies, cooperation with other companies, and going after completely new customer segments or markets with new or adapted products and services. This is the first in a series of blog posts on the topic of growth. There will be more details about terms and abbreviations, tools, KPIs, and how the growth model works for different types of companies and more detailed walkthroughs of bigger terms like SEO, content marketing, conversion rate optimization, email marketing, keyword research, personas, and customer journey mapping in future posts. Are you interested in learning more about what you can do with this model? Send me an email by clicking the button below. Don’t you agree that more people should read this? Be an awesome person and share! Augmented reality – vår nya verklighet med iPhone 8? Behind every part in the Growth model there are plenty of smart things/best practise to implement to optimize growth. This checklist includes things you definitely should know about for every part in the model.